This stone stele depicting a strong and elegant standing figure of Avalokitesvara, the Bodhisattva of Compassion, again reflects the persistence of the Gupta aesthetic in Licchavi Nepal. Here the Bodhisattva blesses a female devotee with his boon-bestowing gesture (varada mudra) as she kneels in prayer at his feet. Stylized flames and pearl medallions border the curved arch surround . The Bodhisattva wears a distinctive crested crown with scrollwork above a single band of pearl beads. Except for the small Amitabha image in its central panel, this crown is similar to that worn by excavated royal figures in terracotta dated around the seventh century. His déhanchement and stalwart posture, massive shoulders, robust chest with only slightly attenuated waist, and serpentine arm-bands all reflect the aesthetic impact of the famous seventh-century Kathmandu caitya of hvaka-Bahal, in which Nepalese artists formulated their own type of Bodhisattva image by adopting the crown in place of the carved chignon, and by adding patterns to the plain fabric of Indian dhoti models (such as the striped and geometric motif seen in this image), as well as the serpent motif of the armlets and the treatment of the sash . Ultimately derived from Sarnath models, Avalokitesvara’s sash is here draped at mid-hip, knotted in a loose swag, then delicately modelled into pleats which fall naturalistically into a point beside his ankles. In the Dhvaka-Bahal sashes, the pleats are stiffly splayed against the doorjamb, while the more naturalistic draping of the sash is found in the eighth-century stone sculpture of Maitreya (h. 45 cm) in Nag-Bahal, Patan . A similar sash is also seen in the eighth- to early ninth-century stone sculptures of Avalokitesvara at Chabahil and Kathesimbhu, both of which have far more slender body proportions for the Bodhisattva . Therefore a seventh- to eighth-century date can be suggested for this sculpture. 1 The uppermost portion of this arched surround and also part of the plain base below the Bodhisattva’s feet are modern restorations. 2 The scale is also similar to the Bodhisattva statues of Dhvaka-Bahal, which measure 70 cm according to Gutschow, The Nepalese Caitya, pls. 352–53. 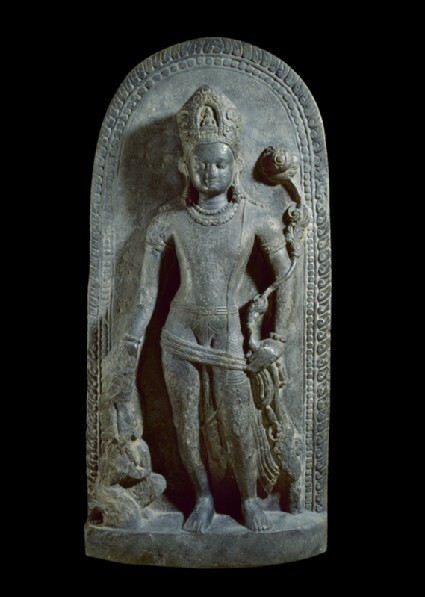 For a detailed discussion of the Dhvaka-Bahal sculptures, see Pal, The Arts of Nepal, vol. 1, pp. 27–33. 3 See Slusser, Nepal Mandala, pl. 472, for the Maitreya of Nag-Bahal. 4 See Pal, op. cit., pls. 187–88, for the Avalokitesvaras of Chabahil and Kathesimbhu.